Park up, keep your keys and jump on one of the regular transfer buses to the terminal. You can expect a smooth arrival and departure with this service. 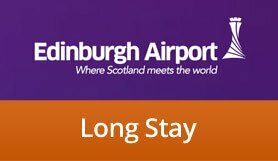 Edinburgh Long Stay is manned 24 hours a day and frequently patrolled by security staff. The site has comprehensive CCTV, high fencing and security lighting. Edinburgh Long Stay has also been awarded the Park Mark, a national security award accredited by the Association of Chief Police Officers. To achieve the Park Mark, car parks have to be inspected by the police to prove that they have modern security measures and are clean and well-lit. There are disabled parking bays by the exit, next to the customer services office. The transfer buses are wheelchair-accessible. At the entry barrier, press the button on the ticket machine. The system will validate your booking and print a ticket. If you have any problem, use the intercom and our staff will help you. Once you park, note the zone and take the free shuttle at the closest bus stop. Make sure you keep your ticket for your return, To exit the car park, drive up to the barrier, insert your ticket in the machine, the system will check your details and the barrier will open.